This exhibit shows examples from all of the zemstvos known (thus far) to have used partial stamps - mostly bisects - to frank mail. The use of partial stamps was dictated by the available supply of a given denomination. 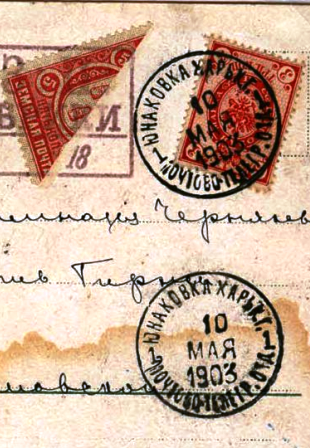 When stamps the zemstvos had ordered failed to be delivered on time, or when the basic rate would change and no stamps of that denomination were on hand, then stamps that could be divided to achieve the proper postage were used. It appears that Irbit Zemstvo, Perm gubernia was the first to employ bisected stamps, in 1870. Six zemstvos within Perm gubernia used bisects; three more that resorted to them were neighbors of that gubernia, and two were further removed.